如用支票捐款，抬頭請寫: Coalition for Excellence，並填寫個人信息表格，然後將支票和表格郵寄至：Attention: Mei Mei Huff, P.O. Box 4243, Diamond Bar, CA 91765. 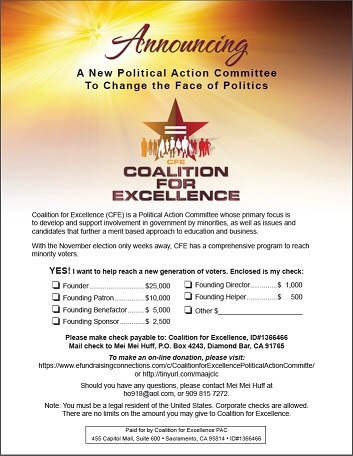 CFE is a Political Action Committee whose primary focus is to develop and support involvement in government by minorities, as well as issues and candidates that further a merit based approach to education and business.